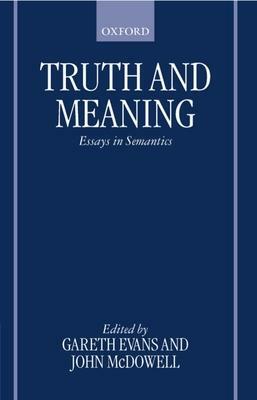 Introduction ; I: Meaning and Truth Theory ; II: Reply to Foster ; III: Truth Conditions, Bivalence and Verificationism ; IV: What is a Theory of Meaning? II ; V. Two Theories of Meaning ; VI: Truth Definitions and Actual Languages ; VII: On Understanding the Structure of One's Language ; VIII: Semantic Structure and Logical Form ; IX: Language-Mastery and the Sorites Paradox ; X. Existence and Tense ; XI: States of Affairs ; XII: The De Re Must: A Note on the Logical Form of Essentialist Claims ; An Appendix to David Wiggins's Note ; XIII: Is There a Problem about Substitutional Quantification? Gareth Evans was Wilde Reader in Mental Philosophy and Fellow of University College, Oxford; he died at the age of 34, in 1980. John McDowell is University Professor of Philosophy at the University of Pittsburgh, having previously been a Fellow of University College, Oxford; he is a Fellow of the British Academy, and a Fellow of the American Academy of Arts and Sciences.